Whether you're celebrating the birth of a child, the kindness of a friend, the closing of a business deal or sending condolences, Blossom Shop is here to help! The Blossom Shop has been around for many, many years! A landmark in the Mulberry community, the store has been blessed over the years with several different owners. Mary and Jeff Marvin bought the shop back in May of 2018from Janice and Jerry McKinney. 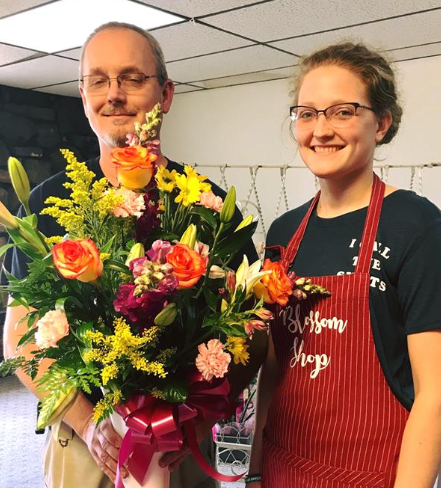 They hold a passion for fresh flowers, plants, and funeral work, but realize there is more needed in the community, that's they added an array of items to their inventory. Bags - Insulated, Tote, Metallic, etc. Gifts for all ages and more! Our doors are always open! Call us today at (479) 997-8177 or shop online 24/7! We are your trusted Mulberry, AR florist, providing fresh flowers and much more to the community.